Dressed for a Canadian winter – For the fainthearted . 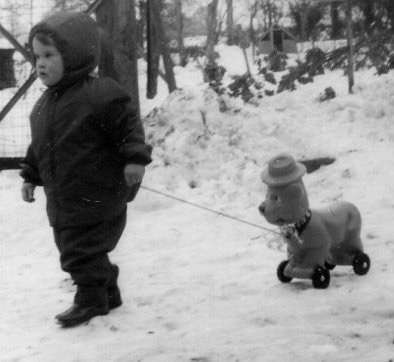 . .
Whilst scanning through old photographs, there was a moment of realisation that Canadian affluence had reached the life of a small boy four years prior to the 1967 visit. Among pictures from the severe winter at the beginning of 1963 are ones of a child pulling along a toy bear on wheels.